Premier League opposition and a big money TV date are both up for grabs should Rovers beat Bristol City tonight. But all Paul Keegan is thinking about the game at Ashton Gate. Rovers’ no-nonsense midfielder is refusing to look beyond City and start dreaming of a fourth round tie with Everton or West Ham. “It’s a massive game for whoever goes through but we’re not even thinking about that,” Keegan said. “Our focus just has the be on the Bristol game. 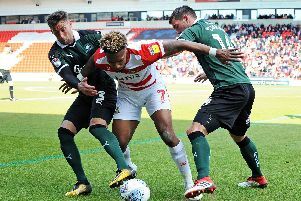 Rovers’ last visit to Ashton Gate, in September, brought a 3-0 demolition in one of the worst performances of the season. And despite impressing in the 1-1 draw at the Keepmoat which set up tonight’s replay, Keegan still feels as though Rovers have a point to prove against City. He said: “I don’t think we played well down there. it’s a tough place to go. “I’d like to go there and beat them to show we’re a good team. “They will have seen that when they came up here. We dominated a lot of the game but we didn’t get the win. “They know they’re in a big game now. “They’re on a good run. They play good football. “But I think if anyone was at the game at the Keepmoat, we showed that we’re more than a match for them. “We’ll take confidence from that and try to beat them. Saturday’s 2-2 draw at Oldham extended Rovers’ away record to nine games without defeat. Keegan says a good result in the FA Cup can kick Rovers on further as they look to climb League One. He said: “Every game you play, in whatever competiton, I think you should go out to win. That’s my opinion, I think that’s the answer.